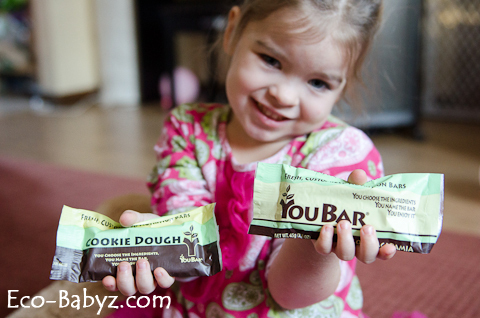 If you are looking to snack healthier in 2013, I would love to introduce you to YouBar. It's perfect for you, for the kids, and for gifts because you can customize it to the recipient's preferences. We had a chance to sample six bars and really enjoyed the flavors as well as ingredients, many of which are organic. We love YouBars on the go for a quick snack. They are very sweet, so we usually have plenty of water on hand to consume with them. I love that there is no sugar and all the sweetness comes from organic dates. With their Build A Bar options, this snack or dessert even fits into our new tooth healing diet without veering away from it too much (certainly not something we can eat every day because of the sweetness, but occasionally). We consider it a dessert and Baby E understands it that way. Since we are not to have grains, nuts, or sugar, we can omit those things when making a bar. YouBar even has an option for wholesale/white labeling, a perfect way to get truly custom, healthy snack bars for personal trainers, nutritionists, etc. There are great healthy gift options for anyone you may think of! You can gift some custom bars to a mom-to-be to nourish her before, during, and after labor. Make a gift for a trying-to-be-healthy family that will be traveling. A gift for kids going off to college. Pretty much anyone! A box of 13 premade bars will cost you around $33, so they end up being about $2.50 per bar. For 2013, they will likely carry a half box like the package we received, it's a nice way to sample different ones to see what you like. The custom bars vary from $2.89 to $4.99 per bar depending on size (not ingredients). Honestly that is too expensive for our budget, but it may fit into yours! 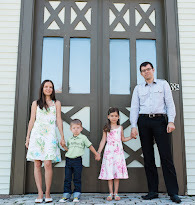 For us that is just under the cost of an entire meal for our family, so if we were to buy them we would do so sparingly - most likely for travel and road trips. They are delicious, no doubt, and the GMO free ingredients make it a healthier option than most bars on the market. 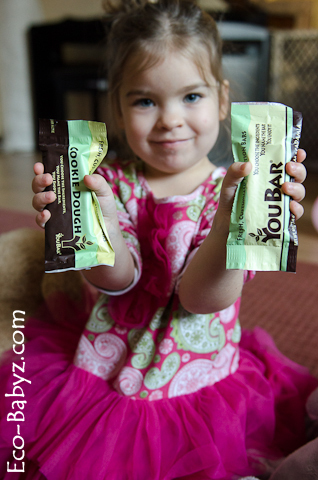 Shop YouBar - Use code ECOBABYZ for 10% off your purchase! This is a great idea for someone with dietary restrictions! They can be sure that the ingredients they want/don't want are what they get! The cookie dough one would be right up my alley! Love the idea of a Build a Bar option. I can't imagine all the possibilities. They definitely offer enough choices for everyone. These look great! I love the option to build your own bar. I just went and tried it out (just for fun), and wanted to try my creation! I'll have to keep these in mind to try sometime. Thanks for the review.